Spring is officially here but in our indoor gardens it’s harvest and sharing season. We are thrilled to learn about the diverse and rewarding stories from our Little Green Thumbs classes! At A Blair McPherson School, parents and about 100 students celebrated the garden. Ms. Woelber reports that her students gave a talk and then everyone shared beans, peas, basil, lemon balm, lettuce and parsley. A student who’s only been in Canada for 6 months from India designed the poster to invite the school community to the event. At Windsor Park School, the students created a “Three Sisters Garden” in early February (see above), after reading the story. 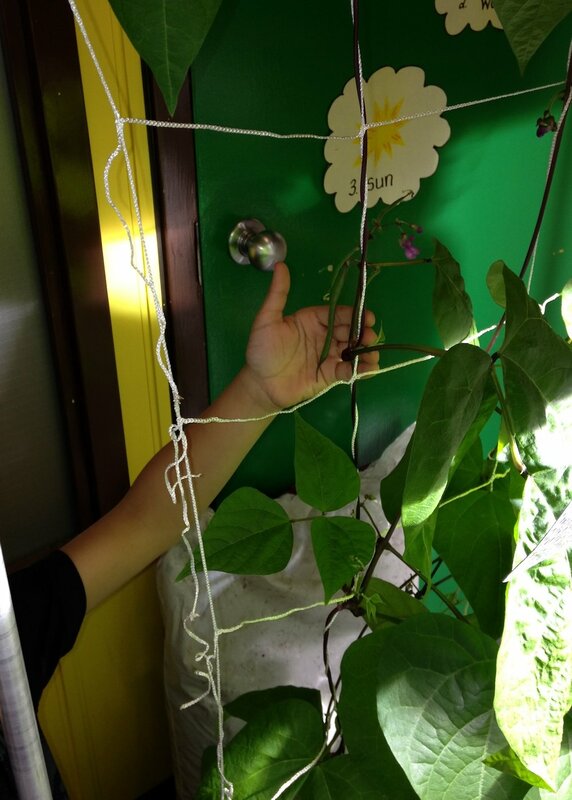 Eight weeks later, the garden box is very prolific with pole beans that have reached the ceiling. Tasty beans are ready for harvest and the cucumber is starting to develop fruit. The class had a “Salabration” in early March and recently invited me to a fun tasting event. The students enjoyed fresh beans, pea and nasturtium leaves, and also yummy lemon balm iced tea. 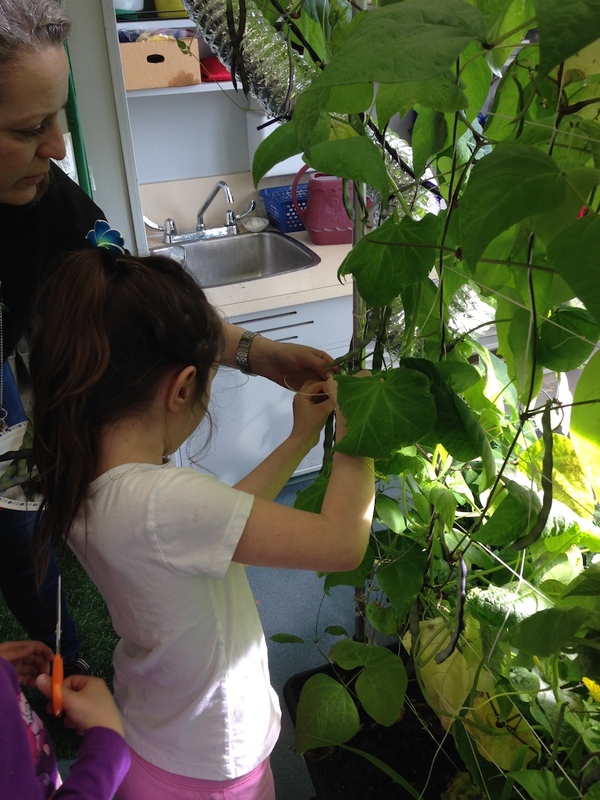 Another salad event took place at Dr Margaret-Ann Armour School. The children harvested, washed and cut up fresh kale to mix in with other salad ingredients. The salad spinner was a popular tool and not a scrap of the kale salad remained when it was time to go home. Indoor gardens also have challenges, including insects that somehow manage to get inside and help themselves to our plants. As there are no natural insect predators in the classroom, soapy water spray or sticky traps may help. In severe cases, the class may need to “cut their losses” and remove plants that are unable to fend off the pests. This is fertile ground for discussions about predator-prey relationships in nature and our role in supporting healthy insect populations in our gardens. At St. Kateri School, a tough decision was made to remove affected pepper plants. Fortunately, the tomato plants fared better and the students have harvested many baskets of yummy cherry tomatoes, and fresh nasturtium leaves (see photos below). Another challenge is watering during holidays. At St. Teresa School, some plants died during the December break. Ms. Hanneman wrote: “We had a great exploration about why the plants died and what we need to do for the next time. Students loved observing the plants that had dried up and comparing them to healthy plants. Students then problem solved for our next planting that will be over spring break. They have decided to write a letter to the daycare that will be here to look after our plants and water regularly. 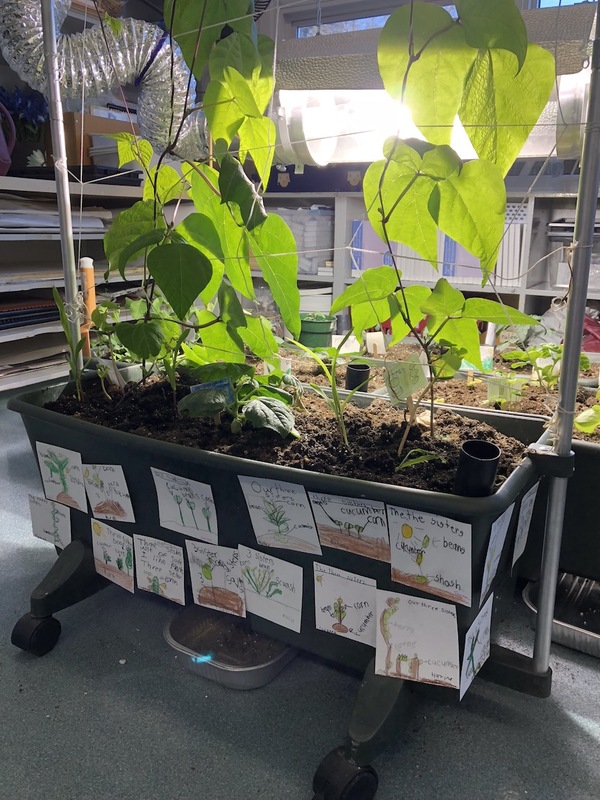 The students have learned a valuable lesson about the responsibility of taking care of plants to have them grow.” What a great writing activity and a chance to involve the daycare children in the indoor garden. Humans are not the only ones in need of fresh vegetables for nutrition. In the Genesis Early Learning class at the Edmonton Valley Zoo, the gibbons have shown a clear preference for indoor garden lettuce versus store bought lettuce. The children also grew KATNP that has been shared with some of the big and small cats. Gardens foster feelings of awe for nature, and they are great for experiential learning. Such are the adventures in many of our Little Green Thumbs classrooms. At Weinlos School, the children decided to plant some sunflower seeds that a student had brought in. Surprise! It turns out that the flowers are monsters that claim a good portion of the grow light to themselves. The plants are about 150 cm tall! The lovely flowers will hopefully develop into tasty seeds the students can enjoy. Another adventure is brewing at St. Francis of Assisi School. The students planted seeds from pumpkins they carved for Halloween. Now they have both an orange and white variety of pumpkins growing. The two plants have slightly different growth habits; while one is trailing on the ground, the other is more upright and bushy. The huge leaves and flowers are impressive and we look forward to seeing how they develop. Gardens also present many challenges or learning opportunities. On occasion, pests such as aphids or spider mites seem to appear out of nowhere. It pays to spend time observing the plants and scouting for trouble. Unlike an outdoor garden, winter indoor gardens do not have the benefit of predatory insects helping to control pests. In many cases, soapy water and rubbing the critters off with a gentle hand will help. Other times, we need to admit a little setback and start again or take joy in the crops that succeed. As with other things in life, persistence eventually pays off! We were very fortunate to connect a few of our Little Green Thumbs classes with producers in the Edmonton area (see other blog posts) in the last couple of months. The children were very attentive and had many great questions and stories for the farmers. In turn, we were so pleased with personal stories the farmers shared with the children. Trudy and Kirk Harrold explained the importance of being good stewards of the land that has been in their family since 1907, for 4 generations. The farm is near Elk Island Park and they are passionate about creating healthy soil, protecting soil from overuse and also reserving spaces for wildlife. They see how healthy the land is by how well the wild animals are doing on their land. The family is proud of the food they produce for Albertans while working hard to protect the land and environment. Kirk and Trudy brought samples of grains they grow, such as wheat, barley, oats, canola, and peas. 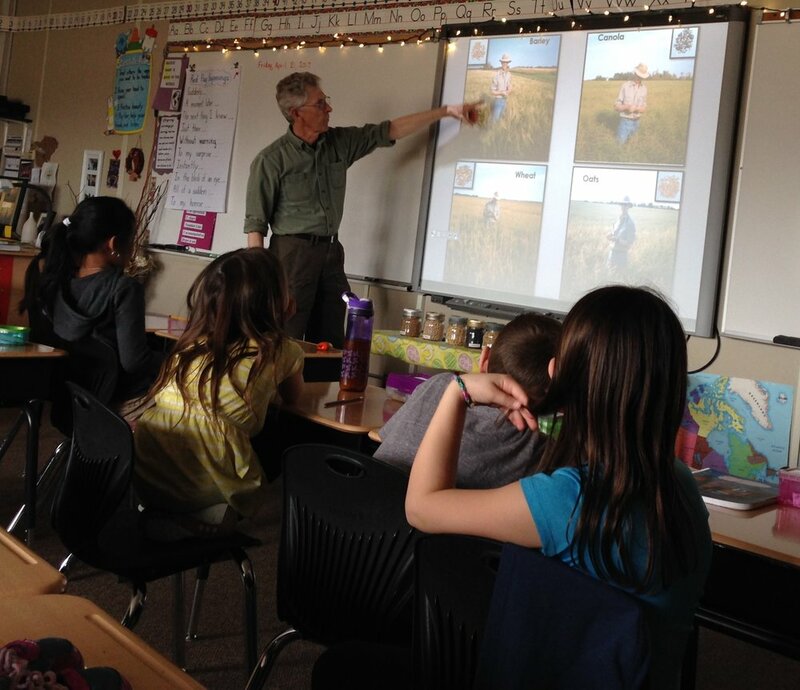 Photos from the farm showed the crops, animals and wildlife they care for. Last fall, the Harrold family is one of many farming families in Alberta unable to bring in a large portion of their crops. They are hoping for a better season to come and we thank them for learning more about farming. “What’s the best part of your job?” was a question Ben Stocks was happy to answer. Stocks Greenhouses near Sherwood Park produces tulips, other flowers and veggies for the market. Ben loves working outside, having lots of freedom and producing flowers and vegetables that people want to buy. He is noticing a resurgence in locally grown food. Cucumbers are becoming more popular again for pickling, and his sweet corn and other veggies are always snapped up quickly at the market. The children learned how he plants tulip bulbs in the winter and keeps the bulbs cold for several months before they start growing in the greenhouse. Once the flowers are almost ready to open, they are picked, loaded up on the truck and taken to the market. Ben really enjoys the moments when the flowers are at their prime and ready to be received by happy customers. “What’s the worst part of your job?” asked the children. Many crops, including watermelon, are grown under a plastic tunnel or in a greenhouse. The strong spring and fall wind can sometimes rip and damage the roof of these structures. Wondering what the weather might bring is one of many challenges of farming. We also learned that growing tulips in the field was very difficult before Ben’s family got dog Maggie. Hungry deer would mow down all the tulips until Maggie got the job of chasing the deer away. Little Green Thumbs classes have a unique opportunity to get a taste for growing plants right in their classroom. In a few years, perhaps some of these children will be part of the emerging trend of young families giving agriculture a try, growing food crops, raising animals, keeping bees, or growing flowers or other agricultural products for our local markets. Bees are very important for the pollination of many plants, including fruit, berries, vegetables and other crops. Some of our Little Green Thumbs indoor garden classes learned about bees and honey production from beekeeper and educator Patty Milligan. The students explored different stations where they had an opportunity to touch, see and smell objects related to beekeeping. There was a bee box with frames of comb and queen boxes to explore. The children had fun putting on a hat and veil, then pump the bellows of the smoker that’s used to calm the bees. With gleeful smiles, a couple of students rubbed their hands in a box with dried pollen, only to realize that the yellow powder was stuck until they got permission to go wash it off. There was also a box with propolis, a special compound bees collect from tree buds to fill cracks in the hive and sanitize the interior of their home. In a time when both wild and domesticated bees are suffering from population decline due to habitat loss and pollution, learning about their life and role in food production is timely for our young gardeners. 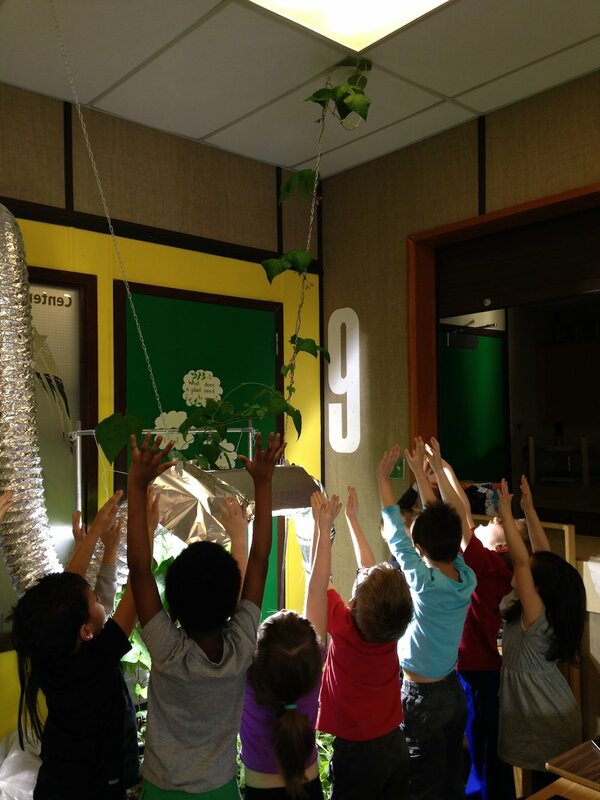 Every classroom involved with Little Green Thumbs has slightly different ways to incorporate the indoor garden into daily learning. Below are snapshots of some of the activities at our schools. Just before the holidays, the Centennial School kindergarten students were keen to help transplant some tender veggie plants they had started from seed a few weeks earlier. To make sure the plants were going to thrive during the Christmas break, our volunteer Isha spent a couple of hours with the children, helping them with the delicate job of transplanting tomatoes, cucumbers, basil and lettuce into the grow boxes. With a bit of adjustment to the light’s height and increasing the timer, we’re hoping the plants will grow nicely from seedling to mature plant in the next few months. 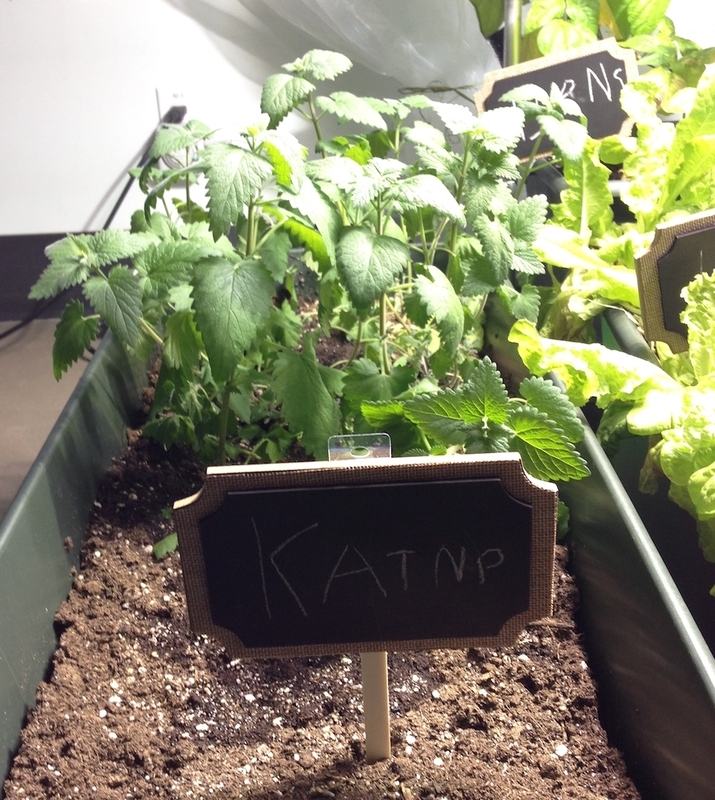 January 26 update: Check out the prolific growth of this indoor garden in the gallery below. 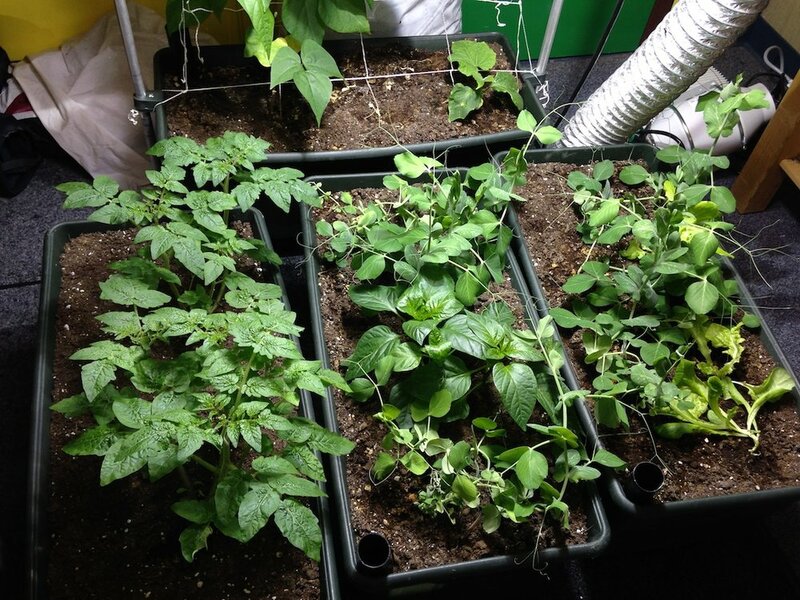 The beans are touching the ceiling and the tiny tomatoes transplanted on Dec 20 are now large, healthy plants! 2016 has been declared the International Year of Pulses. Buddy the Turkey came to visit some of our Little Green Thumbs schools before the holidays.